It’s rare to be surprised by something new in video games these days. A lot of the time it feels like you’re just playing slight variations of the same thing repeatedly. 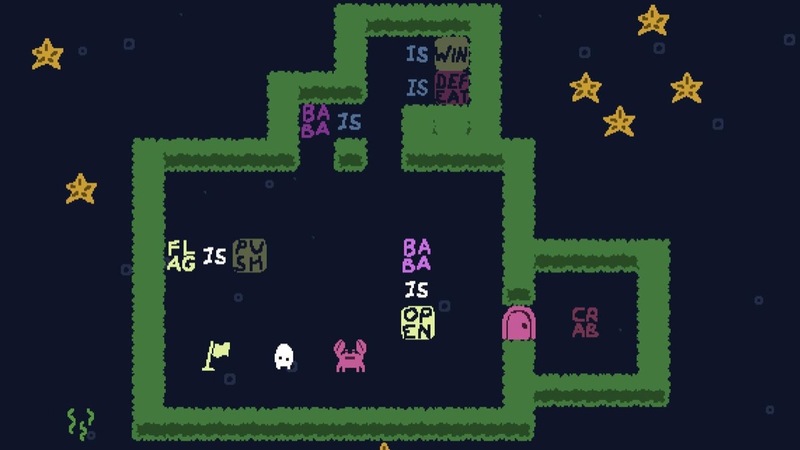 Baba is You, an indie puzzle game by Finnish game developer Arvi Teikari, feels fresh. In it you play as lots of characters but mainly as a pixel-art rabbit named Baba. Your goal as Baba in each of the game’s many levels is always the same: Win. To accomplish this, you’ll do everything from grabbing a flag to transforming a rock into a key, using the key to open the door, then turning the key into a ghost that you push into a lake. Okay, that escalated pretty quickly. Let’s back up a bit. When you start a level there will be phrases strewn about that will tell you what kind of rules you’re playing by. A key for example has no inherent attributes unless you’ve got a phrase such as “Key is open” on the field. The puzzle aspect of each level comes from manipulating or creating phrases to secure some form of victory. If a wall is blocking you from the flag, it’s up to you and your brain to figure out how you can change the rules of the level to let you get through. Baba is You really encourages thinking outside the box. Like, way outside the box. Early puzzles in the game have many different solutions. The wall that’s blocking you could simply have its solidness stripped away by severing the “stop” from the phrase “wall is stop.” You could push blocks in a way that strings together “wall is you” and move out of your own way. You could turn every object in the level into Baba and overwhelm your obstacles with numbers. The world is your oyster, potentially literally. This is where Baba is You shines. The spark of inspiration and creativity you feel upon figuring out a solution just isn’t something you encounter often. This game will make you feel both very smart and very, very stupid. It feels extremely rewarding to bash your head against a tough puzzle and to have that “aha” moment of inspiration where you figure out an extremely elegant solution. If there’s one large complaint to be made here, it’s that the early creativity-focused puzzles with many solutions are pushed to the side later in the game for devilishly challenging puzzles with only a single answer. Some players may be turned off by how difficult the game becomes and would rather have a fun sandbox where they’re breaking puzzles instead of solving them. Aside from that, there’s plenty of content to be had and the game’s Commodore 64 style of graphics are often cute and easy to read. 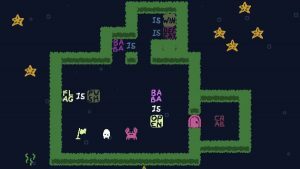 Baba is You is available on Steam and the Nintendo Switch for around $18.